It's probably happened to you, particularly if you live in proximity of an urban environment. You live for some 30 years in one location and you think you know the place pretty well. Then, a client calls and says, "We're replacing this foot bridge over the railroad tracks at 35th Street so we need you to inspect the Douglas Tomb." The what now? 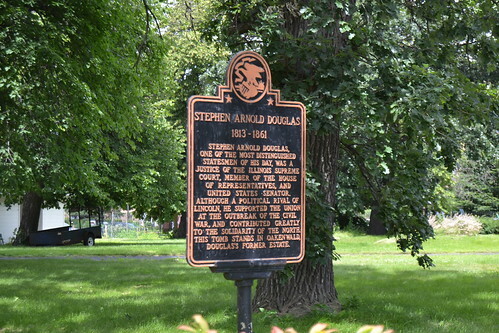 You all know Stephen A. Douglas, right? He was famous already before he debated a young state senator by the name of Abraham Lincoln. You might have heard of him. They debated a total of seven times across the state leading up to the election of 1858. Douglas defeated Lincoln to retain his seat in the US Senate. He was hugely instrumental in the Compromise of 1850, which was to have "settled" the issue of slavery once and for all. He believed, very strongly, in the right of the populace to decide the laws under which they would live. He never came out against slavery. He was always arguing for the preservation of the union over anything else. His opposition to the Dread Scott decision by the Supreme Court gained him the Democratic nomination for president but split the party in two, creating a southern Democratic party. This paved the way for Lincoln to win in 1860. I assumed he was buried downstate. He was born in Vermont. He and his first wife, who was the daughter of a slave owner who had a plantation in Mississippi, moved to Chicago in 1847 to take advantage of the new town's growth. After his defeat in the presidential election of 1860, he tried to find a compromise to the impending secession. He offered to mediate any meetings to keep the union together. Once Fort Sumter was bombarded, he read over Lincoln's call for troops to put down the rebellion. Lincoln asked for 75,000 men. Douglas disagreed and urged Lincoln to ask for 200,000 men. "You do not know the dishonest purposes of these men as well as I do," he told Lincoln. He was in Chicago in the spring of 1861 when he contracted typhoid fever and died in June. He was buried on land he owned on the south side of Chicago. Leonard Volk was hired, in September of 1861, to be the custodian of the grave site and he began the business of raising funds to build a suitable memorial. What is on the site is a scaled back version of what Volk initially proposed. The cornerstone was laid in 1866 with formal dedication later in the year. But, financing a war and with it President Johnson's spending in office shut down construction for several years. The state of Illinois was asked, repeatedly, to chip in $50,000 to finish the tomb. Due to foot dragging (Imagine that), the bill languished and so, therefore, did completion of the tomb. Finally, in April of 1881, the necessary funds were appropriated by the state and the tomb was finished. It's a square monument on a circular base. 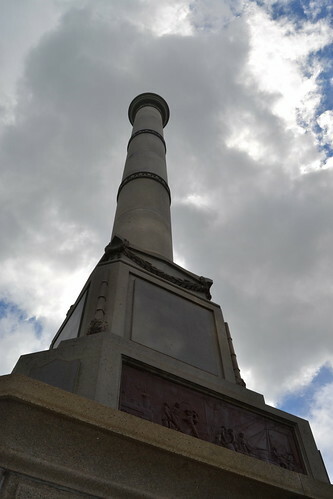 There is a statue of Douglas on the top of the column. 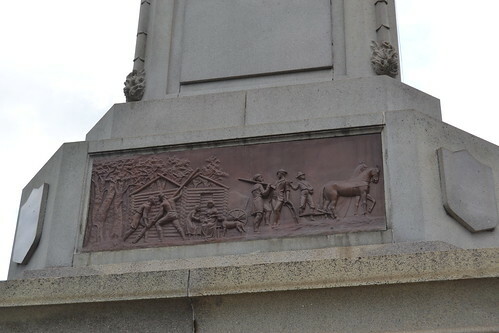 Below the column are bronze bas-reliefs depicting Native Americans, pioneers, commerce and education. 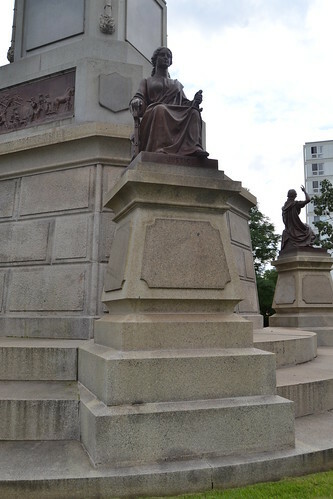 There are also four bronze statues off the corners of the monument. They represent justice, history, eloquence and Illinois. The monument is limestone. 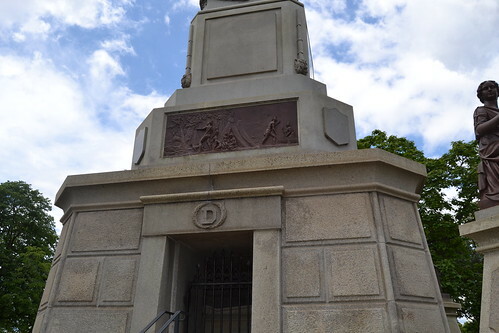 You can view Douglas' tomb via an entry on the east side. 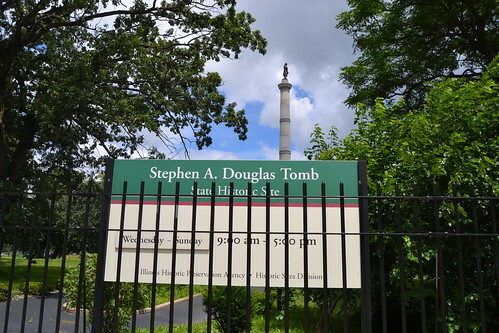 When the monument site is open, there is a caretaker available to talk about the tomb and Douglas' life. I was there during unofficial time, which was great for being able to do my job, but not so good for wanting to know about the tomb and its construction. 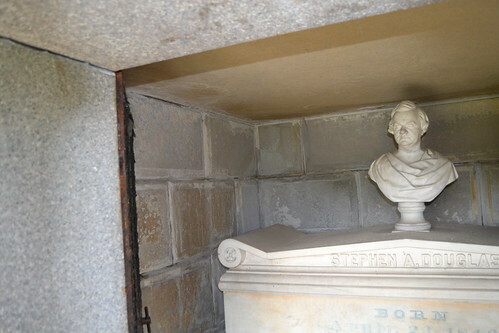 There is no door so you can see inside to the tomb itself and the bust which rests on the tomb. It's in wonderful condition considering some of these stones are over 100 years old. I apologized to Senator Douglas for having to take photos of his final resting place. I found a couple of chips in the limestone of the monument and general cracking of the caulking between the stones. 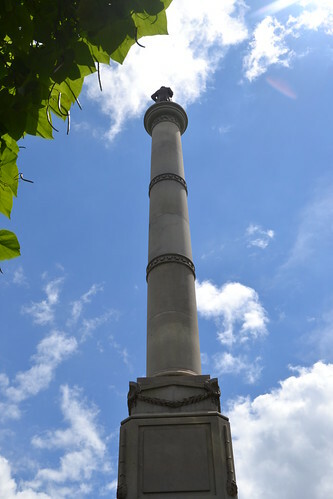 The Illinois Historical Society believes this is the oldest state memorial. 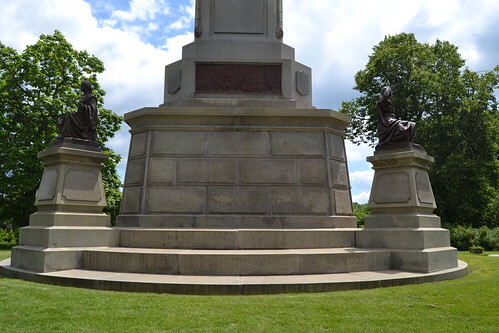 There are benches to sit and gaze at the monument. I have to go back to this area for more inspections so I'm going to try to time my travels to when there is someone at the site to talk about the tomb. I just want to hear what they have to say. There was a Union prisoner of war camp near this location, on 160 acres of land the Douglas family owned. I knew of this camp, but I didn't know exactly where it was located. So, I was thrilled, once I learned where this was, to be given the chance to inspect it. I also am embarrassed to admit I didn't know about this. It takes longer to get here than to tour the monument but it is a gem.